The US data did not support USD and today there are Unemployment Rate data in Eurozone along with pending home sales m/m and Chicago PMI in the US. 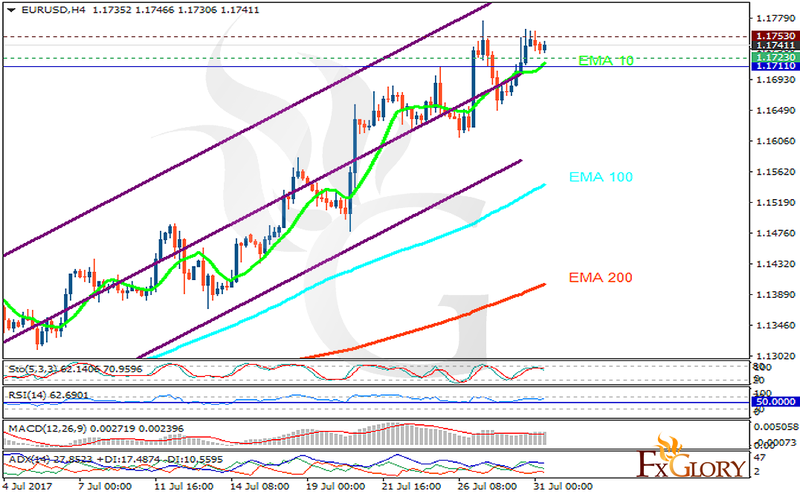 The support rests at 1.17230 with resistance at 1.17530 which both lines are above the weekly pivot point at 1.17110. The EMA of 10 is moving with bullish bias along the ascendant channel and it is above the EMA of 200 and the EMA of 100. The RSI is falling towards the 50 level, the Stochastic is showing downward momentum and the MACD indicator is in positive territory. The ADX is not showing any clear signals. It seems that the pair has started its correction pattern heading downwards therefore short positions are recommended targeting 1.164.